An underwater theme, some nice, watery sound FX, and plenty of big prizes: you’d be forgiven for thinking you’re playing one of Microgaming or Playtech’s many sea-themed slots when you fire this one up, but Big Catch is actually from land-based giants, Novomatic. With some suitable aquatic-themed symbols on the reels, together with solid 5-reel, 20-payline betting action that starts at $0.01 and goes right up to $20 a coin, Big Catch deceivingly caters for fans of simple slots action but who want a decent chance at hitting it big. Mixing it up on the reels with the 10-through-Ace poker symbols (here disguised as sponges) are anchors and Big Catch logos. 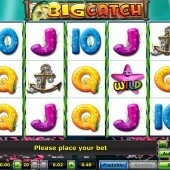 Five Big Catch logos pays out a $10,000 jackpot, but the logo can come Stacked on the reels. 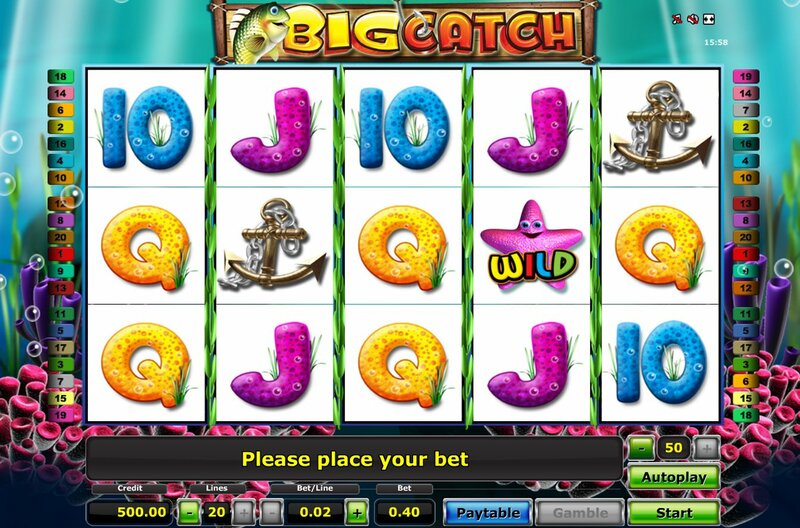 In fact, 15 Big Catch symbols on the whole screen pays out $200,000. The Wild in the game is the Starfish. He substitutes for all symbols in the game but only appears on Reels 3, 4 and 5. However, don’t forget you can easily get lots of Stacked Wilds so big wins are there for the taking. Hook, Line and Sinker! There's No Bonuses! It's All Random! If you’re looking for bonus Scatters in Big Catch, don’t bother – there aren’t any. Instead, the game’s one bonus round triggers completely at random, so you’re at the mercy of the slot this time. Go Fishing for the Prize Catch! You’ll know when the ‘Go Fishing’ feature has triggered as the base game screen will clear to make way for an underwater setting. A fishing hook moves across the top of the screen above the reels. Click on a reel as it moves past and a hook will drop down to pull up a fish. Depending on which fish you hook you will be awarded a different cash prize: a Clownfish awards a $10,000 jackpot, while the blue fish awards a ‘Monster’ payout of $40,000. However, hook the ‘Prize Catch’ fish and a whopping $200,000 prize is yours. Fishing-themed slots are great for a little slice of the outdoors, but Novomatic’s offering certainly guarantees some big casino-friendly jackpots to slots-weary punters. Microgaming’s American-themed Alaskan Fishing is definitely a great alternative to Big Catch, while Playtech’s fun fish-themed game, Fish o’ Rama, is perhaps closer in terms of atmosphere.